If you purchased a license for version 7.x or 5.x, then you get version 7.5.2 free of charge. You can use the same license details. A few small improvements based on feedback from the past weeks. Improved: In case a user runs the setup with elevated privileges and at step 7 of the setup, he/she chooses to automatically add ASAP Utilities to the Excel menu for all users, then that user no longer has to log off/log in in order to see ASAP Utilities added/updated in Excel. Other users on the system will see ASAP Utilities updated in the Excel menu when they (re)login after the setup has been completed. 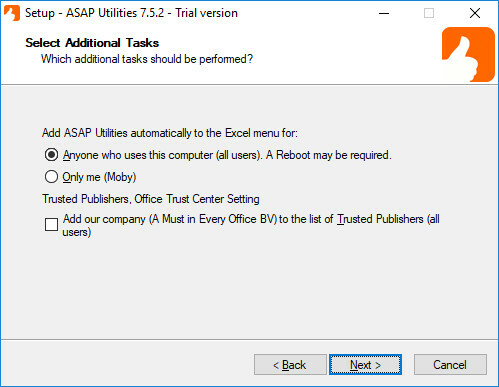 If you want the ASAP Utilities menu to be automatically added in Excel for all users on this computer choose "Anyone who uses this computer (all users)". This will automatically add ASAP Utilities to the Excel menu for each user that logs in on the computer. This is also handy when you log in with normal user-rights and run the setup as an administrator.